From majestic ceramic roof tiles and exquisitely carved ivory to precious jade statues and delicate images adorning lovely porcelains, antique Chinese parrots are rich with symbolic meaning. For hundreds of years the parrot has held a place of honor in ancient China. Often kept in the living quarters of women, parrots were considered the keeper of their secrets. In ancient China a beautiful colorful parrot was kept in the palace by Emperor Xuanzong during the Tang Dynasty. The bird, excellent at mimicking people's voices was so loved by Emperor Xuanzong that parrots have since been known as the Divine Bird. Traditionally parrots, and other birds, symbolized freedom and long life. A parallel is often drawn between a bird and the life experience and wisdom that comes with old age. A pair of parrots symbolizes affection, fidelity and deep, enduring love. In the ancient Chinese art of feng shui the parrot is a powerful symbol of opportunity and the bearer of good news. It draws positive energy while keeping away the negative. Many types of parrots have feathers that represent the colors of the elements of life, fire, water and the sun. Standing guard on the edges of rooftops and perched along the roof's ridges, roof tile parrots protected private homes and public buildings. Popular in the later 1880s and early 1900s, most parrot roof tiles were ceramic or terracotta with a highly glazed finish. The main purpose of these beautiful ornamental figurines was to produce a positive, or auspicious, feeling within the building as the positive energy, or chi, was drawn by the parrots. The number of parrot roof tile figurines that were placed on the roof indicated the importance of the structure. The maximum number of roof tile parrots allowed was nine and indicated structures reserved for the Emperor or buildings used for meetings with those in high positions in the country. Ivory carvings of individual parrots or parrots with lovely Chinese maidens are strikingly beautiful. An exquisite example of an ivory piece dating from the early 1800s is shown on Ancient East: Fine Art and Antiques of Asia. Standing 21 ½ inches high without its stand, and a full 27 inches with the stand, this 7½ inch wide ivory carving is an unusually large piece. The figure is a Chinese maiden holding a spray of peonies in hand and a T-bar with a parrot in the other. The details of the entire piece are magnificent. Chinese jade, known as the Stone of Heaven, comes from the Sacred Mountains of the West located in Burma. Long journeys were required in ancient times to get jade from these mountains making it more valuable and rare. Magnificent and delicate pieces of hand painted Chinese porcelain depicting parrots range from decorative wares to serving pieces. Many date from the 1700s and are beautiful examples of Chinese Export Porcelain. Two of the most common depictions of parrots are in full flight or perched on tree branches. 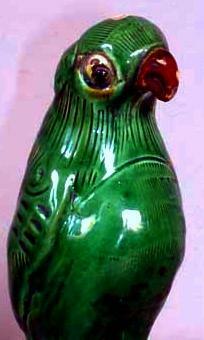 Porcelain parrot statues were also produced as Chinese Export Porcelain and were usually sold in pairs. There are a significant number of reproduction parrot roof tiles being made and sold through various on and offline venues.